US home prices continue to stagnate, at levels well below the peak reached in 2006 during the housing bubble. They fell sharply in 2007 and 2008 during the last two years of the Bush Administration and then stabilized under Obama, first rising a bit and then falling back a bit, but with no overall trend so far. Based on the 10-city composite home price index of S&P / Case-Shiller, the prices of single-family homes in September 2011 were 33% below the peak reached in April 2006. It is useful to view this in the longer term context, as presented in the graph above. While home prices are fully a third off their peak, they are still higher than they ever were prior to 2003. The sharp fall in prices is a reflection of the sharp rise in the middle of the decade, as a bubble built up and policy makers decided not to try to do anything to moderate it. Indeed, many politicians, as well as many existing homeowners, felt quite good about the rapidly rising prices. Then the bubble burst, and the consequences for the economy have been clear, as the economy collapsed in the sharpest downturn since the Great Depression. This was then followed by an anemic recovery, with still high unemployment. Recovery from such “balance sheet recessions” are normally slow, as the entities with the over-extended balance sheets (mortgage holders in the US; the corporate sector in Japan in the 1990s) seek to hunker down and save their way out of their predicament. Asset prices recover only slowly at best. If nothing is done, US home prices are likely to continue to stagnate, and may well fall further. As indicated above, while prices after the bubble burst fell by a third, they are still only at the level seen in 2003. Yet between 1997 and 2003 they had already doubled. That home prices have not now fallen further than simply to 2003 levels is therefore even a bit of a surprise. They could fall more. And as seen prior to 1997, there can be long periods when prices are basically just flat. Those households with negative equity in their homes (commonly referred to as “underwater”) face major difficulties, even if they can afford to make continued payments on their homes. They cannot refinance at the current low rates for mortgages, unless they can come up with extra cash to bring the mortgage down to 80% (generally) of their current lower home value. And they cannot sell their house to someone else, perhaps to move elsewhere for a new job, without bringing extra cash to the closing to pay off the remaining mortgage balance. The housing market remains frozen, and with that, the economy remains in the doldrums. Unless something major is done, this weak housing market will likely keep the economy in the doldrums. And there is no reason to believe that there will be a jump in housing prices to levels similar to those at the peak of the bubble, with this then curing the problem of the underwater mortgages. Rather, a comprehensive program, led by government, will be necessary to restructure these mortgages, to unfreeze this market and allow the economy to recover. 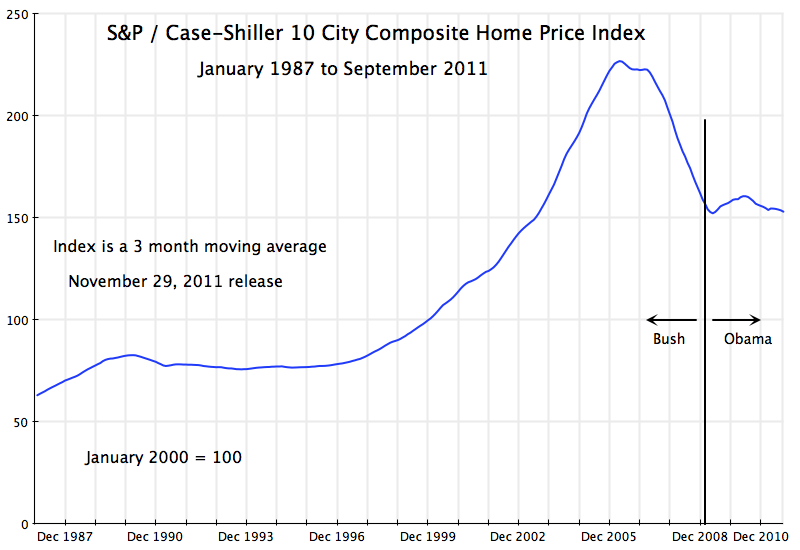 This entry was posted in Housing and tagged economic crisis, home prices, housing by aneconomicsense. Bookmark the permalink.